Interest rates are rising slowly throughout time, with interest rates still around 4% now is the perfect time to buy. We look back at where rates have been over the 40 years! In 1970’s rates were almost at 9% rising in the next decade to almost 13% and falling back to 8% in the 90’s. In the decade of 2000’s interest rates dropped down to 6.29%. Making it easy for many home buyers to buy. However this next decade we have dropped an additional 2%, interest rates are NOW at 4%. It is projected that rates will go up a full percentage point by this time next year. 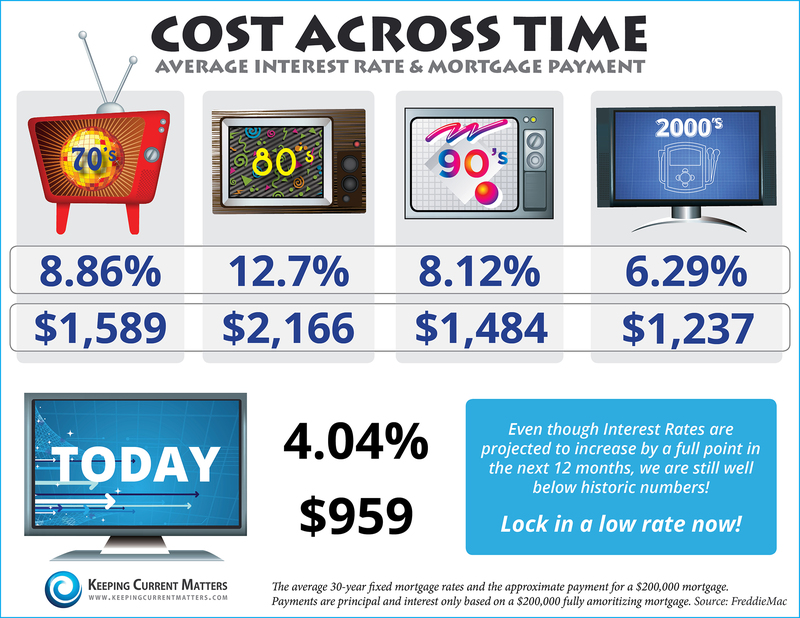 The impact your interest rate makes on your monthly mortgage cost if significant! Interest rates are such a huge impact on home affordability, it can change a borrower’s monthly payment by hundreds of dollars a month depending on how much higher the interest rate rises. If a consumer is looking to buy a home, their credit standing significantly impacts the rate she or he qualifies for on a home loan, as well as debt obligations and down payment on the property. If you are planning or thinking of buying a home in the next few months or year you should prepare to enter the mortgage process and start planning financially. You should definitely be improving your credit score and avoiding unnecessary damage to your credit. For example, applying to new credit cares, spending all your balance on your cards or not paying on time. You want to make smart decisions and be sure that you are a responsible borrower. You can always give your credit a review and figure out how much home you can afford. Therefore be sure to plan ahead and LOCK in a low rate now while you can. Do not wait for the rate to rise to buy a home!